"Since our inception, we have basically been a village club with strong local ties. Some which spring to mind are the Ashworths, the Bonds, the Camplings, the Coles, the Delderfields, the Hales, the Rosses, the Sims, the Syretts and the Vladars. Like all clubs, we have had our ups and downs over the years. However, even in our darker hours, there has always been a strong underlying feeling to keep the flag flying after so long a history, and to avoid bringing down the wrath of past generations who, if they have nothing better to do with their considerable time, may still be watching us from their celestial surroundings. We at Denham have always been blessed with a long, if rather thin, line of stalwarts who have laboured long and hard, not only to keep the club aive and kicking, but moreover to meet the ever-increasing demannds of League standards of both pitch and ground facilities." 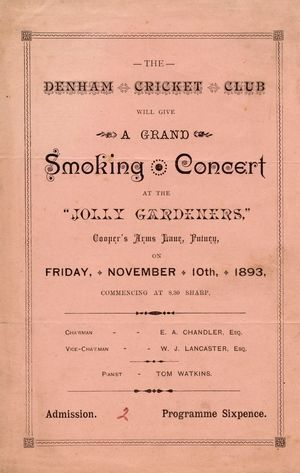 Here are some pictures of a programme (price sixpence) for a Grand Smoking Concert given by Denham Cricket Club on the 10th November 1893. 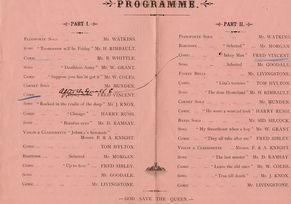 It was a formidable programme with 33 turns (not all by different people): songs; comic acts; cornet, banjo andpianoforte solos; even fairey bells. A 'Mr Livingstone' (no first name or initials, which either meant that he was so well known that he didn't need them, or maybe no one had ever heard of him before) ended both the first and second halves of the Concert with his comic act. There is a Jolly Gardeners in Putney, in Lacy Road, just off Putney High Street. It's out of season (November), so it could have been a fund raiser, but why was it held in Putney? Is the London Putney the only one, or is there a 'Putney' village or hamlet somewhere nearer? Cooper's Arms Lane does not appear in modern London A-Zs; it might have been demolished. But is this the street now called Lacy Road? It was in the early 1920s when the Lord of the Manor, Colonel Benjamin Irby Way, sold Denham Place thereby ending over 150 years of the Way family living in the house. The village cricket was played at Denham Place and a new home was needed for the team. Colonel "Ben" was on the Parish Council and amongst his friends and colleagues were Augustus "Gus" Bronsdon and Richard Morten. Gus owned Orchard Farm at the top of Cheapside Lane and farmed most of the land in the area including the field behind the Village School. After much discussion it was agreed that this new 4 1/2 acre field would be where the village cricket team would be moved to when Denham Place became the property of new owners. Captain Tillard of Maltmas Green, Denham had died in the 1914-18 war and Mrs Tillard provided a pavilion - long since gone - and the lime trees, still beautiful, as a memorial to her husband. On the 24th December, 1920 the Way and Tillard Memorial Ground was leased to the Parish Council for 3/- (15p) per Annum for the "purposes of games and sports each in its proper season by adults being inhabitants of the Parish of Denham". Richard Morten subsequently gave the gates at the entrance of the ground. Eight years ago the Parish Council was able to obtain the land and children are now allowed on the ground. Paul Graham, the present Clerk of the Parish Council, added "The Parish Council built a groundsman's bungalow in 1972 which was used as such until 2001 since when it has been privately tenanted". In the club's old files there is a letter, addressed to the club secretary on official paper headed 'Foreign Office, Whitehall, S.W.1' from Sir Robert Vansittart, the Pemanent Under-Secretary, apologising for not being able to attend the club's AGM later in the month because of 'pressure of work', but added that Lady Vansittart would continue her practice of presenting a bat to the best batsman. 'Pressure of work'. What sort of excuse is that? It so happened that Sir Robert was the Pemanent Under-Secretary at the Foreign Office, and the date of the letter was 1st September 1939 - the day that Hitler invaded Poland. One recent incident at the ground however had Ron [Ashworth] questioning his dedication to the Club. The landlord had carried it round to the cricket ground as a place of safety - for them at least! - and they were waiting for the Bomb Squad to arrive. Fortunately, after much excitement, it was found that the device was in fact only a practice aircraft bomb from World War I - and so the square, the week-end cricket (and Ron) emerged unscathed. The players of the 70s were able to lay claim to the honour of having been associated with Big Den. A few season before his sons' (David and Gary) tremendous knocks were the talk of the town, their charismatic father figured in a typically huricane knock, which was part of a quickfire 50-run partnership, during a 2nd XI game at Cookham Dean. Nothing unusual in this, but its uniqueness lay in the fact that the contribution to this total by his partner (Ray Johnners Johnstone) was precisely one run, the other 49 flowing from our Dennis' heaving bat. The scene was set from the monet Dennis arrived at the crease. "Don't you want a guard?" enquired the umpire. "No thanks," replied Dennis, "I've played here before". Poor Johnners was under orders from his partner to stay at the end of the awkward bowler, while Dennis massacred the bowler of his choice. Seeing Dennis had reached his forties while he had not even broken his duck, Johnners got increasingly desperate. Eventually, seeing the strong possibility of another duck looming large, he belted the ball to long on and advanced down the pitch with a fixed glare directed at Denis, yelling "Coming for one". Dennis, muttering dark protestations, reluctantly stirred himself and ambled to the other end, indicating that this one act of condescension to a miserable wretch who could only hit a single, would not be repeated. "When visiting the ground last week, I witnessed the worrying sight of mole hills advancing towards the square. I am not sure if the Council has been made aware of it..." - Denham CC Secretary to Denham Parish Council,1st February 2000. Starting from near the pavilion, an army of determined moles sought to use the cover of winter to invade the cricket square. Week after week their molehills could be seen nearer and nearer the square. A spokesman for the moles said that the moles had been flooded out of their homes and were simply escaping the water-logged areas of the ground. There was in fact a severe water leak underground at this time, so the moles' story may be true. After extensive negotiation with the Council, the moles voluntarily withdrew. "We have made our point. Just because we are optically challenged, don't think we can't see what's going on", they said. Attempts to link a subsequent incident, where a car was set alight next to the pavilion, to a dissident branch of the moles was never proven.